In biology class we learn about the heart, how it pumps blood throughout the body, and how oxygen is inhaled through the lungs. When you lift you inhale and exhale to maximize movements, but why do you do this? How does one know they are training their body in a healthy way or when their muscles are fatigued (rather than based on feeling)? Heart Monitor – To know what ones heart rate is we measure the pulse. Using an LED the change in color on the finger tells when blood is moving. How can this information be simplified to a user and be understood in a different way outside of the realm of medicine? Should visualizations of the body be included? Heart Monitor with Bluetooth connectivity, acknowledges current training zone by color on the wristband. Images below is off of the Mio Website . 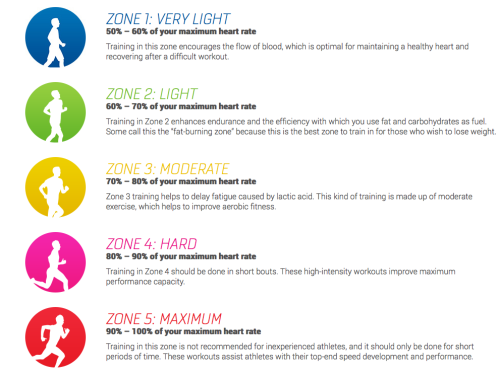 It indicates the 5 heart rate zones that are tracked by the heart rate monitor. My Issues: The wristband shows a simple out put of color, but you have to remember what that means and how it is important to incorporate that into your workout, a feed back of why and how long would be helpful to explain what the training is doing. You know you body is at its max due to red, but how fatigued are your muscles compared to heart rate? I am currently using the products below to extract data and understand it to the simplest of variables so create a component that outputs the information in a simplified, non-medical manner.